First production meeting was held on Thursday Oct. 5th. Lizzy mentioned that she intends to be heavily influenced for the chorus parts by Frantic Assembly for the mechanics of how the Katurian's stories will be told on stage. She will be casting those roles on Friday. 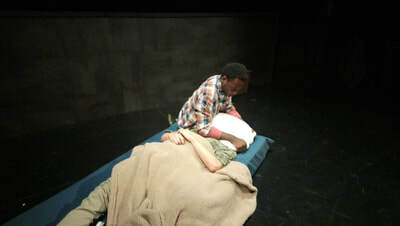 She expects to use the four supporting characters in the chorus as well as an additional 8-10 actors. She wants them dressed in blacks with white gloves and dance shoes. When they are an actual character, like the Jesus Girl, they will add costume pieces on top of the blacks. We discussed color palette for the rest of the show. She wants it to be particularly drab and grey, with concrete walls that have yellowed with age. She and I both did not like the costume that Michal wore in the original production. It was way too colorful and just screamed "I'm the retarded kid". Lizzy wants Michal to be eccentric in the way he dresses but we don't want to telegraph Forest Gump with the costume choice. Lizzy also wants Tupolski to have a gun holster that we will need to buy and a modern looking black gun like a Glock 9mm, which we will also have to buy or rent. We discussed special effects makeup for Katurian. Erika Clark has volunteered to be the makeup and hair designer on the show. Chris said that when he once directed this play that they used a blood cannon for the last fx when Katurian is shot in the head. Lizzie was content with using a blood capsule in the mouth, but since we have a bit of money and a student who is interested in doing fx makeup, she might be persuaded to do a bigger effect. We will also need fx makeup for the story of the green pig. We started pulling costumes for the chorus last week: black jazz shoes, pants, long sleeved shirts, and white gloves. This week we've pulled costumes for our two detectives and today we're starting fittings. Our total spent on costumes for the show not including dry cleaning is $121.99. 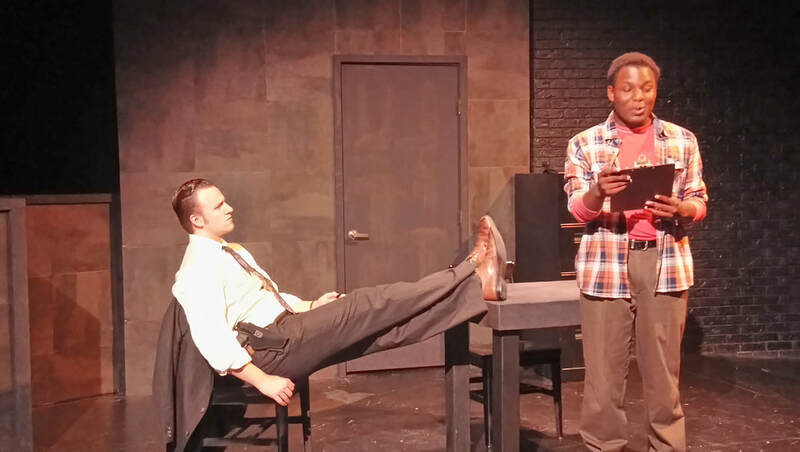 Dark comedy about stories: Writer a murder suspect in MCC's 'Pillowman'. 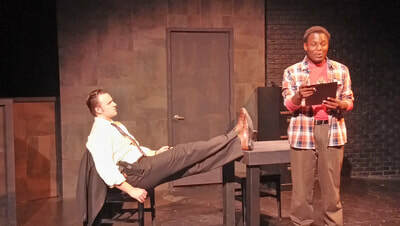 Interrogators Ariel (Garrett Borel, left) and Tupolski (Jonah Hardt) press writer Katurian (Jamal Wilson) about the odd details of his stories in McLennan Theatre's "The Pillowman". As detectives/investigators Tupolski (Jonah Hardt) and Ariel (Garrett Borel) get into their tag-team questioning, their reasons begin to surface: Some of the author’s unsettling short stories involving child violence have details that resemble those uncovered in some recent brutal child murders. Are his stories revealing a connection to the murders? Sheer coincidence? And why is his mentally slow brother Michal (Christian Trigleth) being detained as well? 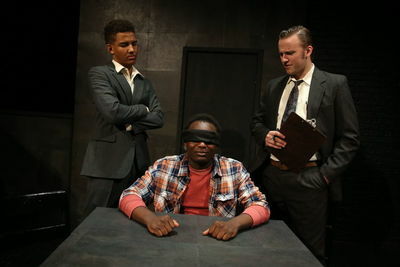 On the surface, it looks like a police procedural, a mystery needing solution, but as the investigation proceeds and some of Katurian’s dark fairy tales come to life, the play drifts into questions of creativity and repression, of imagination and inspiration, of shades of truth. While the subject matter and implied violence make it strong going for some audiences, McDonagh’s use of language, humor and dialogue creates a play that’s more dark comedy than grim drama, the director said. 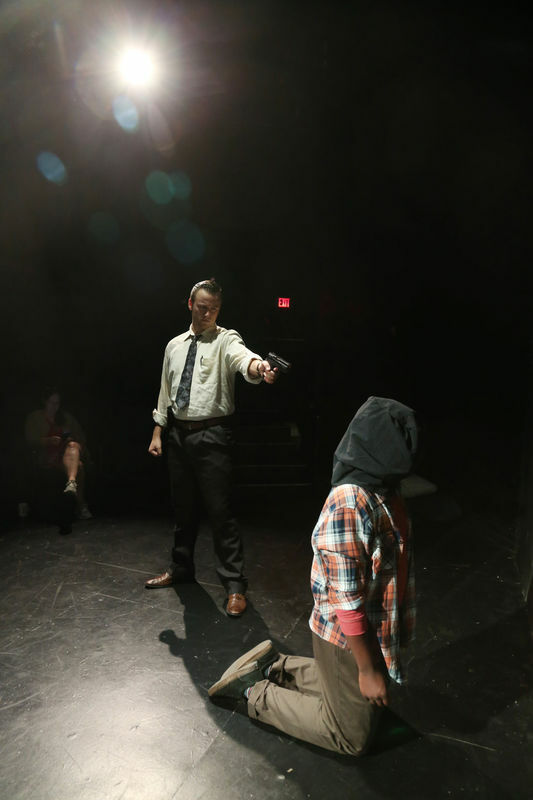 “McDonagh’s an amazing playwright . . . almost David Mamet-ial in his language,” said Elizabeth Talbot, the McLennan Community College theater and stage movement instructor who directs the McLennan Theatre production of “The Pillowman.” The play opens a four-performance run on Thursday. “It’s not suitable for children. It’s quite graphic in parts and we retained some of the (strong) language,” she said. McDonagh’s intent wasn’t to make audiences squirm, however, but spark some thinking about storytelling, imagination and the effect a writer has on his or her readers, she added. 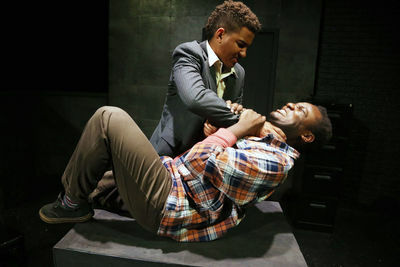 Talbot, who grew up in England and studied theater in London, noted that McDonagh’s 2003 Olivier Award-winning play is standard fare in many English theater schools. 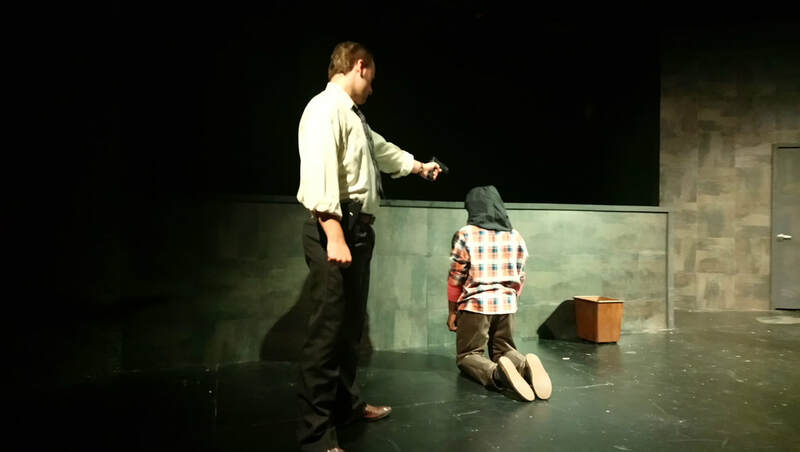 “The Pillowman’s” language feels more British than American in its rhythm and structure, though Talbot’s four principal actors and nine ensemble players won’t be adopting English accents. The play is staged in MCC’s Music & Theatre Arts Building theater, a smaller space whose intimacy ratchets up the play’s emotional intensity.